Portlet is small fragment of dynamic content in the web page. And this dynamic content may be text,HTML,xml or some other MIME format. Portlet technology implemented by JSR 168 and JSR 286 standards. Generally in web application we are very familiar with servlet technology and portlet technology is similar to servlet technology but it consist its own features. servlet technology based on client and server architecture in the web world here the client is browser. Portlets life cycle is managed by portlet containers these are in application servers. portlet life cycle consist different stages like instantiation,serving and destroying. Portlet containers are similar to servlet containers to manage entire life cycle of portlet. Generally in the portlet technology each page consist one or more portlets and each portlet render dynamic content to make complete web page. In technical understand portlet technology implemented in Java in the package javax.portlet. This portlet API consist many interfaces and implementation classes to developed portlet based application in the web world. Generally in servlet web application each servlet will be referred by URL to invoke or access and each web page content will be served by one servlet but in portlets each page will be served by different portlet and each portlet will have its own lifecycle and own URL pattern to execute. Servlet will generate dynamic content which send to browser and it’s in single web page but portlet will server fragment of dynamic content and portal page is responsible to aggregate content from different portlet to generate whole page. There are many people implemented the portlet technology. Portlet containers is responsible for run the portlet and it provides the required run time environment. Portlet containers manage the life cycle of portlets. 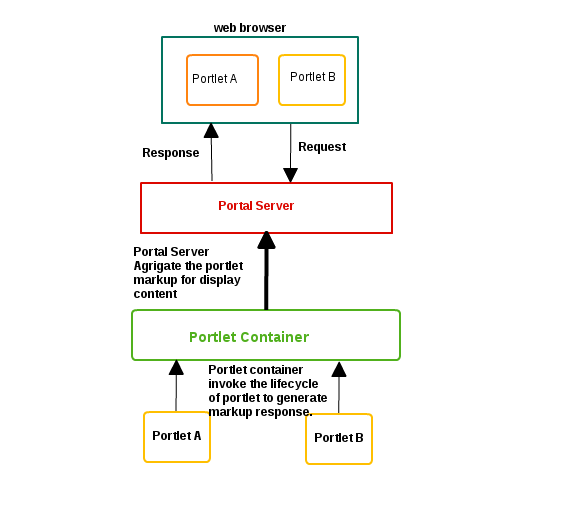 When ever portal server send the request then portlet containers receive the requests and its invoke the respective portlet to process request means its instantiated the portlet and execute appropriate life cycle methods to prepare response. Portlet container send portlet response back to portal server like that portal server receive responses of different portlets and aggregate all response to complete client request. Application servers are responsible to process client request and send response back to client. Application server provided different services to manage and run web applications. The services like JMS, JNDI, JTS, JAAS, JDO,Connection Pooling and all these services required by the applications. Application servers integrated with different containers to provide different run time environments like servlet containers to provides run time environment to execute servlets, portlet containers is to provides the run time environment to execute portlet, EJB containers to provided environment to execute Enterprise Java Beans applications. Apart from this application severs have more capabilities to provide different services to run different technology based applications. As we already know each portlet has it own life cycle and which will be managed by portlet container. According to the JSR 168 standard portlet have three life cycle stages. Theoretically we have 3 life cycle stages in portlets and these will be implemented via portlet interface. Portlet interface is implemented in javax.portlet package by Sun Microsystems. Every portlet that should implements the portlet interface or it should extend the class that already implemented the portlet interface. As we know portlet have three life cycle staged and the following are interface methods which handle portlet life cycle in portlet implementation. This method is initialize the portlet and this will be called only once when portlet is instantiated, we can say when we drag and drop portlet in page. If any necessary functionality required at initial time of portlet we will use this method and write code here. It is similar to servlet init method. This method can be used to create expensive objects/resources used by the portlet. When user is requested to server then portlet will execute process action method. This method will notify the portlet that used has triggered an action this portlet. , a portlet can issue a redirect, change its portlet mode or window state, modify its persistent state, or set render parameters. Render method will generate content and that will be send to web client. In the portal page we have many portlet we have triggered action in one portlet then all portlet will be executed render method to aggregate dynamic content. The portlet can produce markup that may depend on the portlet mode or window state, render parameters, request attributes, persistent state, session data, or backend data. Indicate to the portlet the life cycle's end. This method allows the portlet to free up resources and update any persistent data that belongs to this portlet. In the portlet life cycle for each action or request the final method is render method. Render method will be called for every time to aggregate content or produce content. Generally portlet have different URL to call these methods like Action URL and Render URL. Action URL will execute portlet porcessAction(----) method and then it will be execute the render(----) method. Render URL will execute the portlet render (---) method only. Portlet have addition Characteristics when we compare with servlet. Portlet has different window states. Window state specifies how portlet will look in the page .Window state decides how much space will be accommodated in portlet page. The following are important window states as for JSR 168 Standards. When portlet state is decided as Maximized then entire page only one portlet is visible. Generally we will use this state after perform some action then we will make widow state is Maximized. Specified that is portlet may share the page with other portlets. This is the default window state. Portlet should only render minimal output or no output at all. Portlet mode specifies that the function will be performed by portlet. Generally following are the portlet modes that each portlet should support as for JSR 168&286 standards. This view mode is when portlet is access or render then portlet is in view mode and this is default mode for portlet. Edit mode will be used to edit some portlet functionality and generally we wil use this mode for administrator to modify or edit something. This will used to provide content to end user about portlet i.e how to use and access portlet like help information. Portlets provide a Portlet Preferences object for storing user preferences. These preferences are stored in a persistent data store, so they will be available across server restarts. As a developer, you don't have to worry about the actual implementation of how it is stored. Like Http Session in the portlet technology also have different scopes of session to share data among the portlet or with in the portlet. Portlet also can use Http Session. Portlet Session by default scope is portlet level what ever the data stored in Portlet Session can be available with in portlet. If we want share data among the portlets then we have to use application level scope so that data can be shares across the portlets. Portlet technology have concept called publics render parameters to exchange data among portlets this is we can all it as Inter Portlet Communication. We can use portlet sessions or public render parameters to establish communication among portlets which are in same page. Portal context provides information such as the portal vendor, the portal version, and specific portal properties. The information allows the portlet to use specific vendor extensions when being called by a portal that supports these extensions and, when being called by other portals, to return to some simpler default behavior. Properties communicate vendor-specific settings between the portlet and portlet container, and between the portlet and the portal. Portlet are packages as web archive file(WAR) this archive file consist of portlet deployment descriptors, resources and other java libraries which are required by portlets. portlet.xml specifies the portlet application related deployment properties and it always describes only one specific portlet application. portlet application deployment is a two-step deployment that deploys the Web application into the application server and the portlets into the portal server.